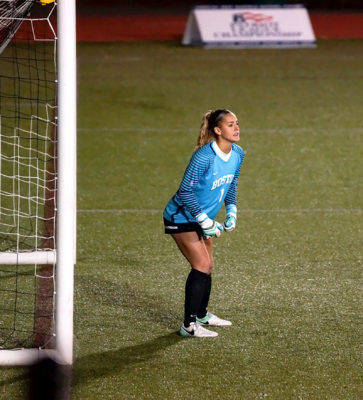 For many freshman goalkeepers playing Division 1 women’s soccer, much of the year is spent on the sidelines, watching and learning as older players tend the net. However, Amanda Fay has had a much different experience in her first season with the Boston University squad. The freshman has played 1,196 regular season minutes in goal for a team that got the third seed in the Patriot League Tournament. Fay was one of the main catalysts of the Terriers’ (10-7-3, 6-2-1) success in conference play. She had shutouts against seven Patriot League teams — the first shutout she had occurred when she spent the whole game in net on Sept. 16 against American University. She has allowed just four goals in Patriot League tilts this year. In addition to her conference shutouts, she also shutout two non-conference teams, Dartmouth College and Harvard University. Her Patriot League play is impressive considering the manner in which she began her career. After being thrust into the spotlight in the final 15 minutes of a 2-0 loss to the University of Cincinnati in mid-August, Fay received her first start on Sept. 10 against Boston College. Facing an Atlantic Coast Conference team in her first ever nod proved to be a tough task for the freshman. The Eagles (10-9-1) unloaded three goals despite being outshot, 12-10, by the Terriers going on to win 3-0. At that point, BU boasted a record of 1-5-2 and needed some consistency in order to turn their season around — Fay stepped up and found her niche in that role. Beginning with her 6-0 shutout of American University (2-15, 1-8 Patriot League) in which the Terriers took task to the Eagles with an 18-3 shot advantage, Fay became a reliable force in goal. This victory marked a five-game straight shutout streak and a 555-minute scoreless stretch for Fay — her team enjoyed an 11-0 point differential during that time. The improvement in Fay’s approach rested on her communication and footwork in net, two aspects that assistant coach Molly Poletto has assisted her with, Fay said. Feldman said that her freshman goalkeeper has improved and will continue to get better. Fay said she has fit in well with her new group of teammates, something that has allowed her to feel comfortable on the field. Fay has also benefitted from having one of the best defenses in the Patriot League in front of her. The Terriers defense has allowed forced Fay to make 2.56 saves per game, the 10th lowest mark in the conference. Having a stout defense in front of her prevents Fay from being bombarded with shots by opposing scorers, something that the Fay said she is thankful for.